DAMBULLA, Sri Lanka (AP) South Africa opener Quinton de Kock hit 87 to set up a comfortable four-wicket win against Sri Lanka in the second one-day international on Wednesday. Opting to bat first after winning the toss, Sri Lanka made 244 for eight in 50 overs, with captain Angelo Mathews scoring an unbeaten 79. South Africa then reached its target with 43 deliveries to spare. Captain Faf du Plessis hammered 49 in 41 balls with 2 sixes and 3 fours, while Akila Dananjaya took 3-60. 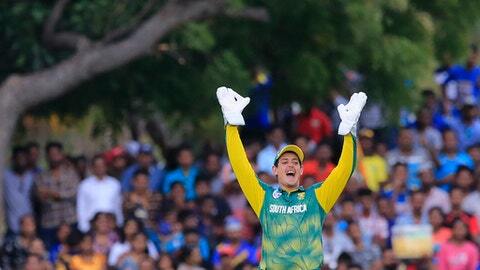 De Kock struck 13 fours and 1 six in his 78-ball innings and was named man of the match. He shared a stand of 91 for the first wicket with Hashim Amla (43). Earlier, Mathews combined with Niroshan Dickwella (69) to help Sri Lanka post a respectable total after having slipped to 56-3. The two men added 67 for the fourth wicket. Fast bowlers Andile Phehlukwayo and Lungi Ngidi claimed three wickets each. Sri Lanka handed first one-day caps to fast bowler Kasun Rajitha and left-arm spinner Prabhath Jayasuriya, while South Africa picked an unchanged side. South Africa leads the five-match series 2-0. The third game is in Kandy on Sunday.